But the question may arise, "How can I make this practical in my own life? What should I do?" The life of faith speaks loudly to unbelievers and to other Christians. It testifies to all that there is a God in heaven who answers prayer. Faith is the opposite of sight; when you can see, you can't trust. To hoard wealth makes the life of faith impossible. The life of faith does not follow automatically when a person becomes a Christian. It requires deliberate action on his part. Enjoyment of riches is not found in possessing them but in using them for the glory of God and for the good of others. A word about the author: William MacDonald (1917-2007) was born in Massachusetts. His parents were from the Isle of Lewis and when he was six years old, his family moved to Stornoway, Scotland, later moving back to Massachusetts. 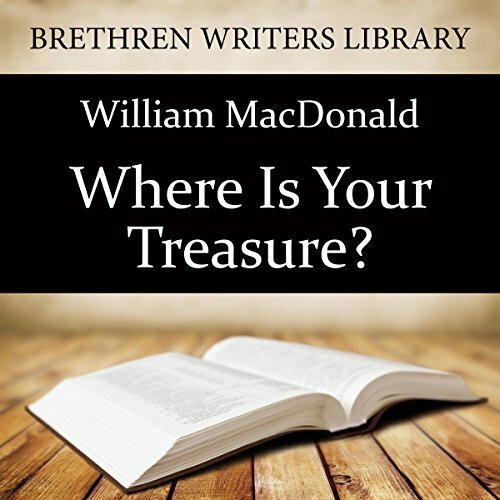 A commended worker for 60 years, a teacher, preacher, mentor, and author of 84 books, including the Believer's Bible Commentary, William MacDonald was a man who said and wrote much. Yet, for those who knew him well, it was his life that left the greatest impression. Speaking of the Lord Jesus, the Bible says, "The one who says he abides in Him ought himself to walk in the same manner as He walked" (1 John 2:6). Bill wrote in his commentary, "Jesus' life, as set forth in the Gospels, is our pattern and guide. It is not a life which we can live in our own strength or energy, but is only possible in the power of the Holy Spirit. Our responsibility is to turn our lives over to Him unreservedly, and allow Him to live His life in and through us."